NOVEMBER 15, 2018 – The Ford PC government’s first Fall Economic Statement emphasized a message of restoring trust, transparency and accountability to the people who elected them, while continuing to hammer the policies and actions of the previous Liberal government and the federal Liberal government. Minister of Finance Vic Fedeli released the 2018 Economic Outlook and Fiscal Review today that re-iterated action to date on many of the PC Party’s platform promises while laying groundwork on how the government intends to further tackle red tape and empower the Ontario economy, often by reviewing signature legislation enacted under the previous government. Absent were signals on what to expect in the province’s long-awaited fiscal plan, as the government continues its work to determine the scale and scope of reforms, changes, and cuts needed to bring the provincial deficit under control. The government announced that it found $3.2 billion in savings through reducing program expenses. Combined with tax cuts of $2.7 billion, the result is a modest reduction of the province’s deficit to $14.5 billion, revised from the initial deficit projection of $15 billion made this summer by the government’s Independent Commission of Inquiry. The government is committed to reducing the deficit, but no long-term forecast was included to identify a path back to balance. All eyes will turn to the government’s inaugural provincial budget, expected in the spring. Minister Fedeli highlighted $2.7 billion in tax relief to date, with a significant proportion coming from cancelling the provincial cap-and-trade program. Newly announced tax relief included a tax credit for low-income people, called the Low-income Individuals and Families Tax Credit (LIFT). Individuals making $30,000 or less will pay no provincial income tax, and those making up to $38,000 will receive a tax break, with the average person saving up to $850, benefitting up to 1.1 million people. This cut serves to offset some of the criticism over cancelling the former government’s planned increase in the minimum wage to $15 an hour in January of 2019, and spreads out tax relief to populations with fixed incomes, such as seniors. The government also cancelled a planned surtax of the wealthiest Ontarians. In support of small businesses, Ontario will no longer be phasing out the Ontario small business tax rate, which could have increased taxes for nearly 8,000 small businesses by up to $40,000 per year. The Fall Economic Statement reaffirms Premier Ford’s focus on defeating the federal carbon tax, and cementing his alliance with other conservative premiers across the country. The government’s Fall Economic Statement put a heavy focus on fighting the carbon tax and showing support for pipeline projects, setting up an Ontario vs. Canada dynamic for the foreseeable future. To further support his opposition to the federal carbon tax, the government will introduce ways to demonstrate the cost of the tax to Ontario consumers. The government rolled back rent control provisions to encourage new rental supply, retaining popular rent controls for existing tenants while exempting new rental units, effective immediately. The Liberals’ pre-election expansion of rent control to previously exempt purpose-built rental units had a chilling effect on rental construction, with builders choosing to recoup their costs through condo sales rather than through long-term rental, shrinking supply in an already-tight rental market. Following the recent announcement of consultations to inform development of a new provincial forestry sector strategy, the Fall Economic Statement announced similar consultations with other important sectors of the provincial economy. A new Minister’s Agriculture Task Force will be set up to advise the government on opportunities to reduce the regulatory burden and promote growth for Ontario’s agricultural producers and food processors. Similarly, the government is establishing a Mining Working Group to gather ongoing, expert-driven input from that sector as well. Of interest to both mining and forestry sectors will be another new commitment – a comprehensive review of the Far North Act, 2010. Such outreach exercises are, of course, a time-honoured pattern. As with any new government, it remains to be seen whether they lead to new and significant policy directions. 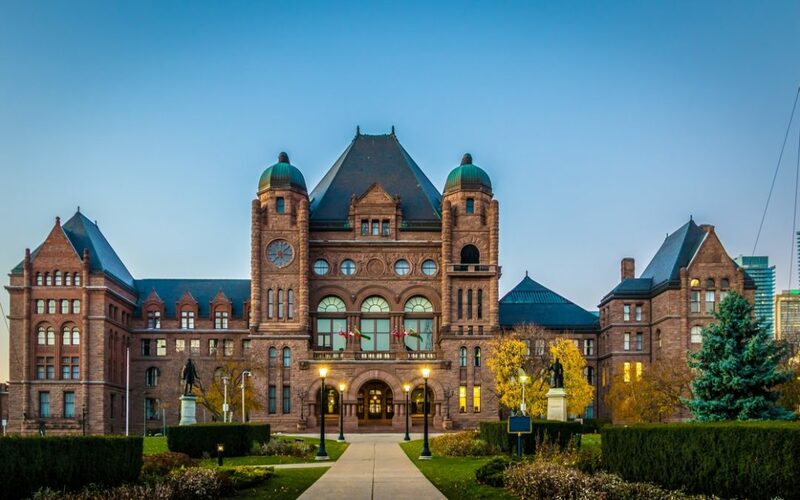 The government has eliminated three offices, reassigning duties for the office of the Environmental Commissioner to the Auditor General, and reassigning the offices of the Ontario Child Advocate, and the French Language Services Commissioner to the Ombudsman. This follows Premier Ford’s promise to reduce the size and cost of government, though whether this can be done while also upholding his promise to maintain jobs is not yet apparent. Minister Fedeli reiterated the government’s commitment to ending hallway health care, though mainly relied on re-announcements such as 6,000 new long-term care beds with 9,000 more in the pipeline, and an immediate investment of $90 million for 1,100 new beds and spaces to help offset strain on the system due to flu season. Concurrently, it announced a planned phase-out of the per-vote subsidy for political parties in 2021-22. Given an incumbent party’s greater ability to raise funds through “access to Ministers” events, the elimination of public subsidies can be expected to disadvantage the opposition parties much more significantly than the government in power. In addition, the government has proposed to raise the threshold for Official Party status in the Legislature to 10 per cent of the seats (which would mean 12 seats today) rather than the current hard number of eight seats. The Liberals currently hold only seven seats, so even one or two successful by-election wins would not see them return to party status, and the significant Legislative office funding that goes with it, before the next election. The government continued to ease rules around alcohol sales, expanding retail hours to 9 a.m. to 11 p.m. seven days a week for all authorized retailers, and in line with forthcoming rules for private sector cannabis retailers. The government is moving closer to expanding beer and wine sales to convenience and big box stores, but has reiterated its commitment to consulting stakeholders. Minister Fedeli restated his government’s commitment to reduce red tape by 25 per cent by 2022 (introducing major burden reduction legislation twice annually), and its commitment to develop the Ring of Fire in partnership with First Nations, which would include revenue-sharing agreements for impacted First Nations and municipalities.